Tech Product Management–what does this mean in a the typical software or hardware company? What is the function, and where does it belong? I have a broad view on this as I’ve held permanent positions in a number of high tech concerns, as well as worked in this area with a great many software and hardware companies in a consulting capacity. Product Management is resident all over the organizational map in High Tech companies. Most often it resides in the marketing department. Sometimes, it’s placed in the engineering/product development department. Occasionally you will see it as it’s own separate function. Again, what does the term mean in a High Tech company? Sometimes it is used interchangeably with the term “Product Marketing”. In this case, it means responsibility from cradle to grave for the product planning and outbound marketing functions for a particular product or product line. In other words, working with the developers to define the product (product planning), as well as driving the other “3 of the 4Ps” for the product–setting pricing, distribution strategy and promotional strategy. In larger companies you will often find this function separated into two distinctly titled jobs: Product Management as the New Product Planning function, and Product Marketing as the function that manages the product after it is released into the market–driving pricing, promotion and distribution as stated above. In this case both functions may still reside in the marketing department, or the Product Planning portion is sometimes in the engineering department. The last variance on this theme that is sometimes seen is that the Product Management resides in the engineering department, but it only vaguely resembles the traditional, marketing-focused definition of the term. In this case it is “Product Planning”, but the job and skill set more closely fit the definition of an engineering project manager, with very little weight put on exploring the market to match marketplace needs with engineering capabilities. In High Tech, the Product Management function is most typically a “matrix” position: lot’s of responsibility for a product’s success, with very little actual authority to ensure that success. Normally a Product Manager’s success will be decided based upon his/her ability to convince other stakeholders across many departments in the organization that the path laid out is the best thing for the company (and the individual stakeholders as well!) People skills are therefore just as important as having technical & marketing skills in most Product Managers ultimate success. 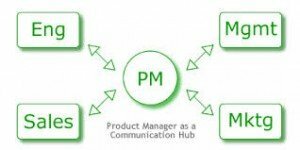 In consumer markets, the Product Manager typically holds much more direct power–much like a mini-GM for his product line. Often product development will even work for him. The term Brand Manager is most often used in consumer businesses instead of Product Manager. (In a big High Tech company, a Brand Manager titled individual will usually fulfill more of a Marcom role). I believe strongly that most high tech businesses would benefit by structuring the Tech Product Management function to be on the strong end of the scale in terms of authority. And there is generally much to gain by putting a savvy, experienced Marketer with a good technical background (but so technically-focused that the gory details are their main interest) in a Product Manager role, where they are graded and compensated heavily by the results of the P&L of their product line. Along this line of thinking, I prefer that both the product planning and outbound marketing functions be unified under the marketing department. In larger companies there may be separate individuals fulfilling these role for an individual product line, but there is significant synergy in unifying these functions as they should both have a strong market-focus. I wouldn’t go so far as to suggest that Product Development should report to the Product Manager in a High Tech company, but I would give them some discretionary budgetary authority on at least a portion of the marketing budget for the product line. I would also make sure they have management’s backing to deal with the developers from at least an equal position of strength. A lack of strength in the product management function is a real problem in many software and hardware companies, particularly those founded and run by developers. When the corporate power structure leans too heavily toward the engineering group and the product management group is “toothless”, you risk ending up with “gee-whiz”, technically-driven products which sometimes end up as “cures seeking a disease”. The Product Manager’s mentality should be that of a “mini-CEO” of his product line analogous to the overall company for a real CEO. He doesn’t have the same type of authority, of course, but a similar mindset is useful. And as implied above, it’s very important that the position does need to have some “teeth”. Too often in technology companies the Product Management/Marketing functions do not have the ability to stand on an equal footing with Engineering. This can lead to a culture of building what suits someone’s fancy, not building what the market needs and will buy as I insinuated above. This can sometimes work for a product or two, but is a very dangerous thing in the long term. A strong Product Management function should serve as the customer’s voice in the product development process, and be an advocate totally focused on that product line. The Product Manager’s sole “business purpose in life” is for his product to succeed. This outlook ensures that the big picture will always been looked out for, eliminating the potential for a product line’s performance to be reduced by turf wars– or by sub-optimal tactical moves due to poor inter-department communication. The Product Manager is there to rationalize conflicting agendas and orchestrate events to ensure his/her product line has the best chance of “success”–whether that means hyper revenue growth or maximizing cash flow for investment elsewhere. I agree with your perspective. I am Director of Product Marketing within a High Tech Company. My Product Managers have responsibility for all 4 Ps and must advocate for the product that they believe will best meet the customers’ needs (both channel and end user). What works best is to have healthy tension between the Product Marketing and the Development functions. The greatest threat to the success of a program is when that tension become “unhealthy” and the customer is no longer in the center of the equation. The other critical seam to work is the one that exists between the Product Marketing and Marcom teams. Would love to hear best practices there, if anyone has some to share. Agree that the product manager must act as a GM or CEO of sorts for his/her product or solution area. Complementary to this thinking is an attitude of “the buck stops here”, which is especially important when problem solving across organizational boundaries. When most successful, product management is an equal peer at the table, along with product marketing and product development. When product management reports into product development, it tends to devolve into “project” management; when part of marketing, you can lose that healthy tension so critical to optimizing target marketings and solutions.